If you've been paying attention you may well have noticed that I am a lover of all things Cheese. I had a Cake of Cheese for my 40th Birthday Party, a smaller version at Christmas and have already made my own Ricotta and Goats Cheese with the help of Big Cheese Making Kit. My name is Foodie Quine and I am a Cheeseaholic. 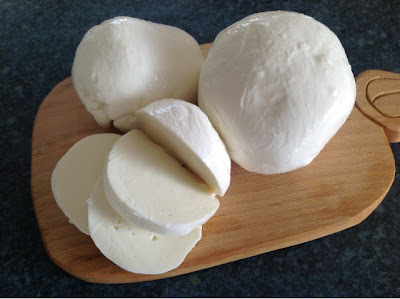 So you can imagine my delight when the April Pinnies & Petticoats Bake Club was declared a Fromage Fest. But then the tricky bit - what to make? 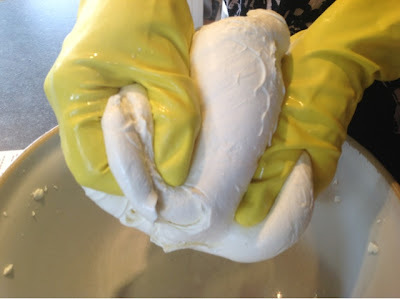 For one reason or another I hadn't got round to trying my Mozzarella making kit but this was the perfect excuse. 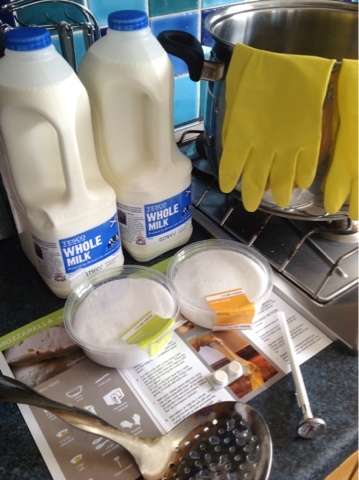 The only additional equipment I needed for this one was a pair of rubber gloves. (Fear not, they were new and not previously used anywhere near a U-bend.) The procedure was similar to the other cheeses I'd made in that you heated the milk to a specific temperature then added cheesemaking ingredients of rennet and citric acid. 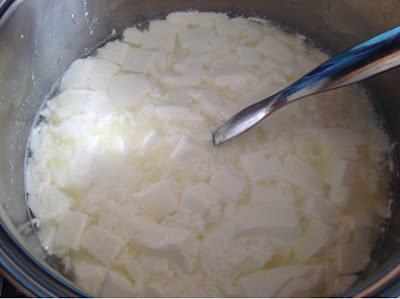 However the resulting curds were much more substantial than I'd seen before and had to be cut into cubes with a long knife. Very therapeutic and most satisfying. Next came the fun bit. Microwaving the curds and kneading them to squeeze out and drain off the whey and make the cheese elastic. The cheese was so hot by this point that the Marigolds were definitely needed. 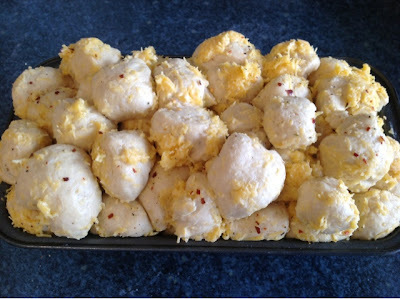 Salt and any herbs/flavourings are added at this point before you shape into balls and set them in cold water. The Mozzarella will then last up to one week in the fridge. I was so impressed with this cheese. Out of the three types I've already made this one really had the wow factor. The taste is awesome too. Boy and Girl could not get enough of it. Will definitely make pizza with the next batch. 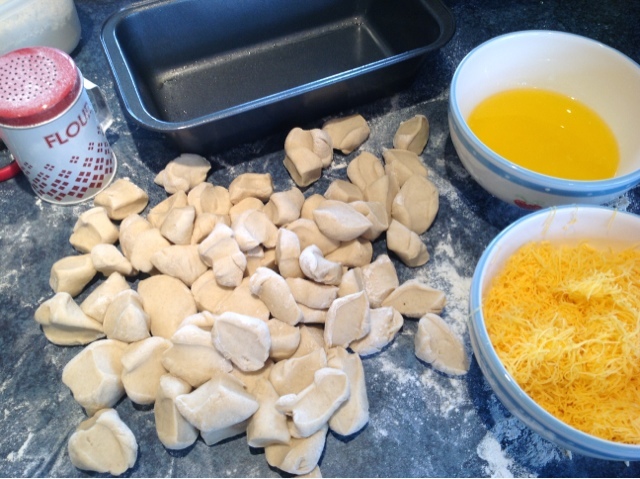 But I couldn't rock up to bake club with just cheese. I needed a cheesy bake to accompany. 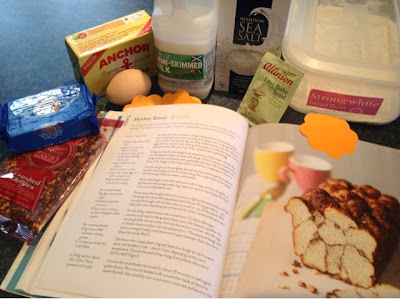 I'd previously bookmarked Monkey Bread in "The Great British Bake Off How To Bake" book. 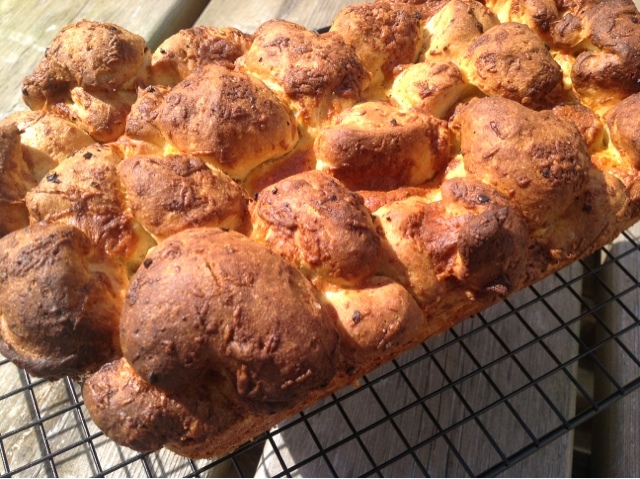 Traditionally its a sweet bread with cinnamon but I opted for a savoury version with cheese and chilli flakes. 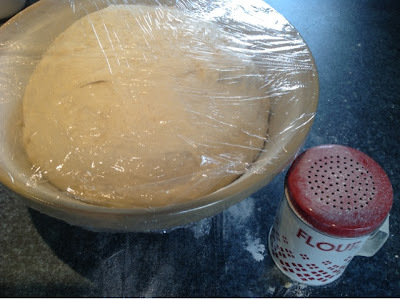 Reasonably straightforward to make the first stage although the 10 minutes of kneading required made me covet a Kitchen Aid even more than I already do. 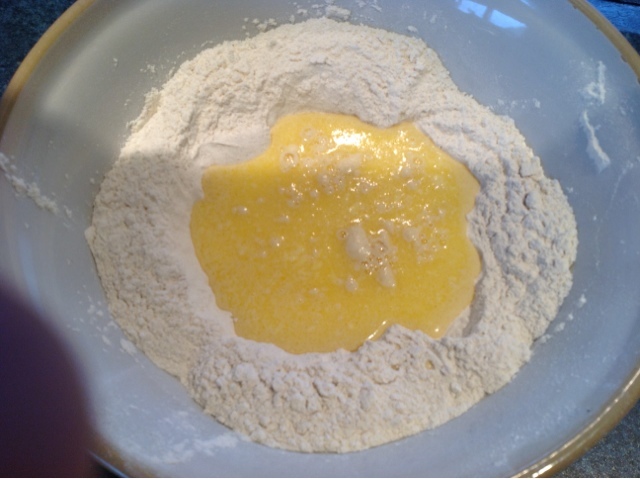 It certainly doubled in size during the first prove. Time to knock back and start creating the monkey puzzle. I snipped the dough into small pieces, rolled into balls, dipped them in melted butter, then grated Lockerbie Cheddar and layered them in a tin with a sprinkling of crushed dried chillies. After the second prove I was a wee bit concerned as it was practically escaping from the loaf tin. The smell when it was baking was awesome but I was a bit concerned that it was over brown however I took comfort in the fact that the majority of Mr Hollywood's loaves on Bread have had a touch of "burnt" about them. And so to cake club where I cut open the monkey and served it with my mozzarella and homemade apple and chilli jelly. It was pretty darn good if I say so myself. The Fromage Fest was undoubtedly my favourite Pinnies & Petticoats meet up yet. Promise to tell you all about it as soon as my cheese hangover has subsided.